Scores from the rain and wind bike tour. Seven mile climb: Actually I sort of liked it. Seven mile mountain descent in heavy rain and strong winds: If I never do anything like this again I will be a happy man. Stuffing bike shoes with newspaper: It work when I was a kid, it works now. Some bikers are getting mold in their shoes from all the rain. The wind: For the first time I appreciated having a strong headwind. It slows you down on steep terror inducing descents. The worst wind on a bike descent is a cross wind which we got on some of the winding curves. Truck runaway lanes: I don't need to see any more of these. 40 some hotel rooms: Ever try to remember what room your in when you've been in a different one every day. Bikers go down the halls putting their cards in the locks to see which one is theirs. I've gone to the desk and told them my card didn't work. The clerk pointed out it probably never would since it was from a different hotel. Hotel remotes: I just could not get mine to work a few nights ago. I then noticed that there was a remote on top of the TV. Seems like the last hotel I was in is missing a remote. Mountain ranges: Very confusing. I think we went through the Taconics and into the White Mountains today. I think they are part of the Appalachians. Riding a bike going backwards: This is true, I swear it. As I approached a T intersection today, a biker was riding fast down a road going backwards. Yes, backwards. I did not know this could be done. Now that I think of it, I don't know why anyone would want to ride backwards. Little known fact: Brattleboro is home to the Vermont World Naked Bike Ride, which was held June 13. Missed it. Jim, Peter, Willie and I got out of Albany, crossed the Hudson and climbed rapidly into the mountains. Beautiful, but the rain and wind, combined with winding mountain roads required intense concentration. The wet downhills were out of my league and I was very very careful. Yes, Peter, Brattleboro seems like a great little town. We will try to get downtown tonight for dinner. Tomorrow 92 miles of mountains, our last real ride getting us into Boston. Please enter the number in red if you would like to post a message. You could see 4 states from this view in the Green Mountains. A guess as to which 4? Bennington VT monument to Col. Seth Warner of the Green Mountain Boys. Died at age 19. Hey Dad, finish in one piece and will see you in two weeks. Are you going to be biking or driving up north? Good luck on your last hard day Dad! Can't wait to see you. We're proud of your craziness! Love you. Fabulous achievement. Be safe! Anxious to learn more about your adventures. How come there are no duck photos? 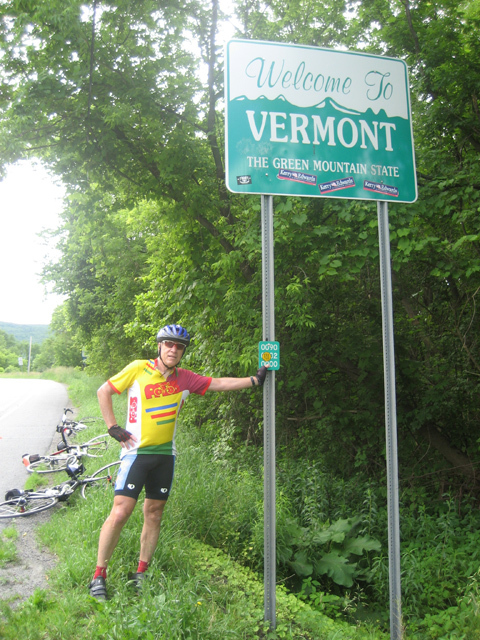 you went thru the green mts., the whites are in northen N.H. some day you may want to stay in Vt. for a bike tour and stay at Inns. It could be fun---- you know fun---- right-fun! I have been on the route you just rode, except driving, many, many times, and I can attest that it can be a harrowing experience in a car. On a bike, in the weather conditions you had - extremely difficult and risky. Depending upon the route you're taking now, if you get to the Lake Sunapee and Mount Sunapee area you'll be in the area where I spent my summers beginning at age 1! It is a beautiful area and there is no more refreshing and sweet water - to swim in or to drink. There are plenty of long and steep climbs - I hope the weather is good. It's not so different than having the Main Street hill at the end of the Dexter-Ann Arbor Run. It will finally flatten out, somewhat, past Concord. Pay close attention for one more day and take it all in as you finish. Nice job! WOW!! I can't believe that anyone could do this. I'm impressed! I guess when you put your mind to something, anything is possible. Great job!! and thought. Glad you missed the naked ride. So very close - please stay safe. This ride is a monumental accomplishment, Al. Congratulations! I'm glad I wasn't there, but it was, none the less, an incredible adventure. Good luck on your last day. Katie and Bubbie were here for dinner. Bubbie was asking how long you had been gone and again telling me what a good wife I am. I don't know about that but I do know that this wife is ready to have you home again. Enjoy your last long ride. Hi Al - The amazing adventure is almost over and I am still in awe of your determination to do something like this. Now, don't take this the wrong way but a naked bike ride is something none of us want to see you do so forget about it! Finish safe, finish strong. Let's hit the links when you get back, I want to hear the everything your not posting.